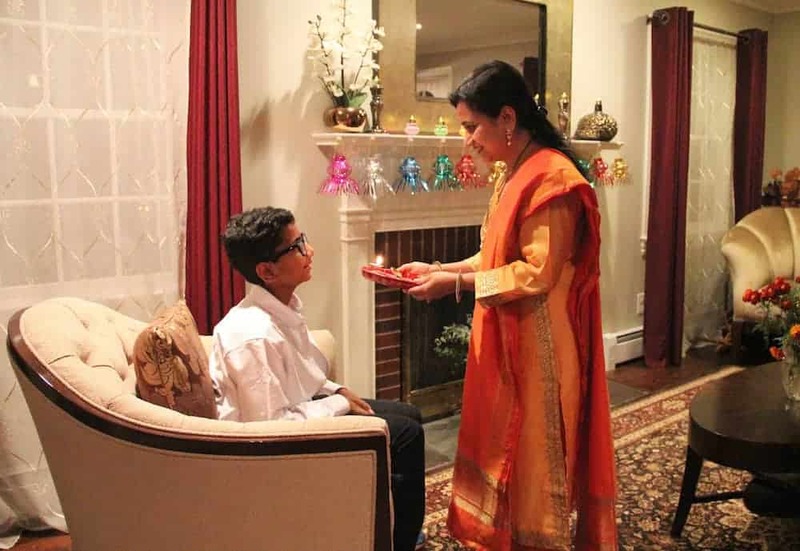 Story of our Family Diwali Celebrations in the USA! After 5 days of a fun-filled Diwali this year I thought it would be nice to share my family’s experience with you. Diwali, which translates to a row of lights, is the main Hindu festival celebrated in autumn. In Maharashtra, where I grew up, it is celebrated with a lot of enthusiasm. 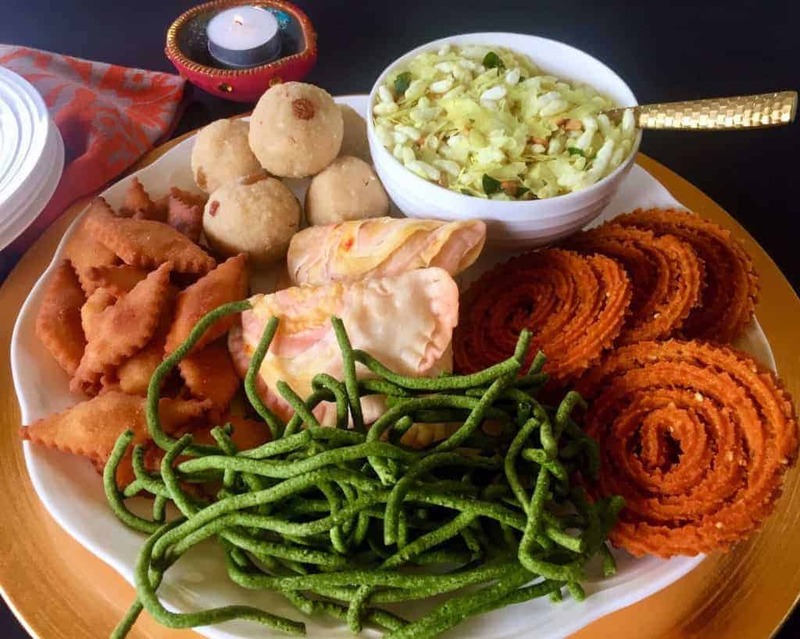 My love for celebrating is a result of my mom’s passion for this holiday, which I mentioned in my last post: rose coconut karanji. 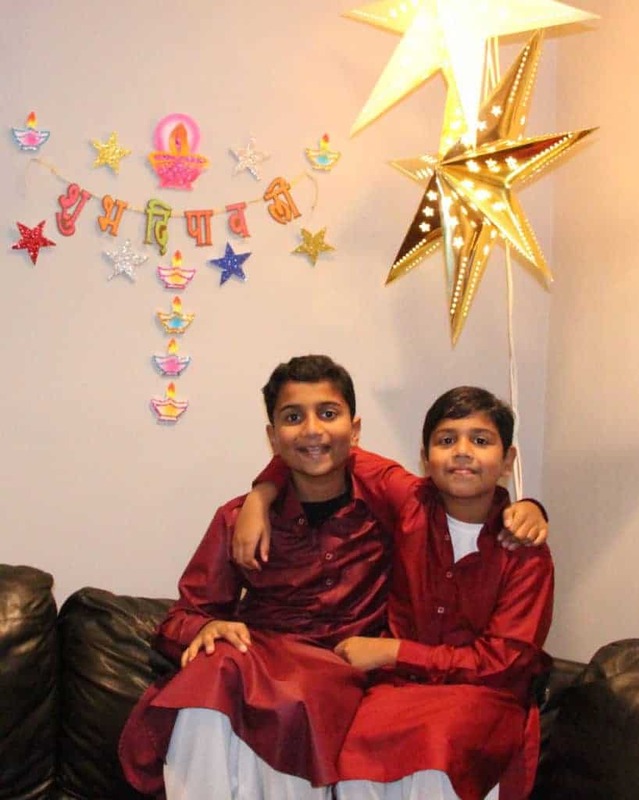 Diwali signifies the victory of light over darkness, good over evil, knowledge over ignorance, and hope over despair – ideologies that are at the core of my family’s values. Like my mom, I prepare for Diwali almost a month in advance. 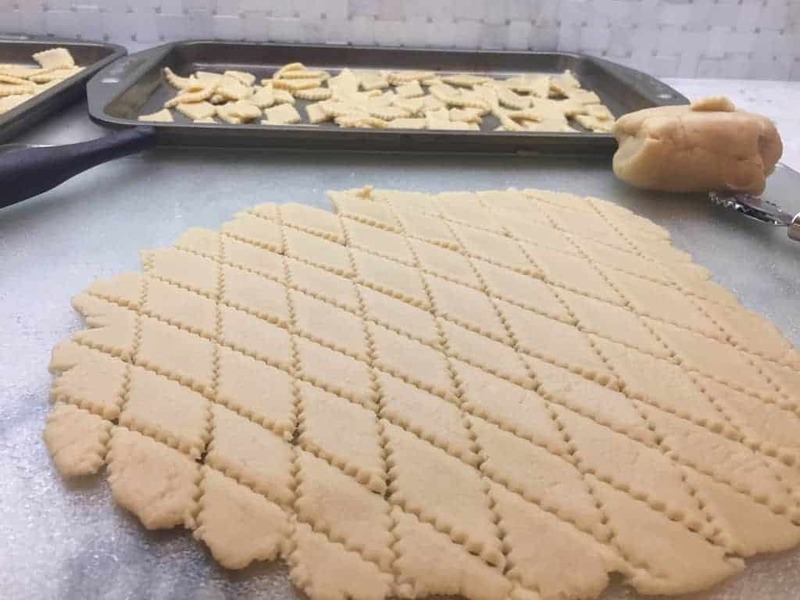 Making the special sweets and savories (also known as faral) used to be a daunting task when I started following mom’s recipes. However, over the years as I have learned the techniques of making each delicacy and the process has become much more enjoyable. Of course, finding time to do it all is always a challenge! There are several ‘take-out’ nights as I am busy making the treats. The end result of seeing my friends and family enjoy the special Diwali treats is very satisfying. 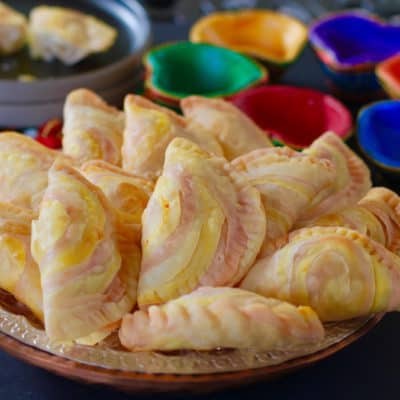 Create a list of faral/sweets and favorite that I plan to make. Make your shopping list for ingredients like sugar, butter, all purpose flour, semolina, flattened rice, nuts, saffron, fresh coconut, etc. Buy all the ingredients ahead of time which saves me last minute hassle of running around. 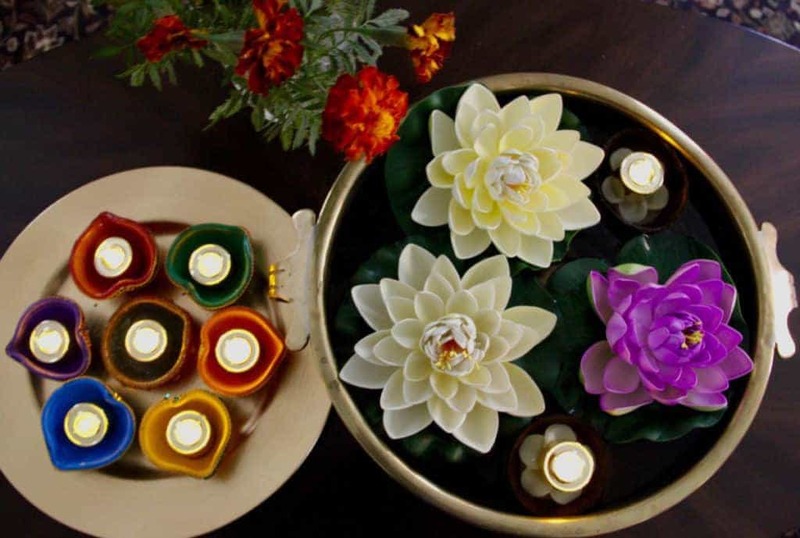 In addition to the groceries pick up plain as well as the beautifully decorated clay diya’s and lantern. Buy some fresh flowers. I find trader joes usually will have marigolds around october/november. With my ingredients in check, I start with making a fresh batch of homemade ghee using unsalted butter. 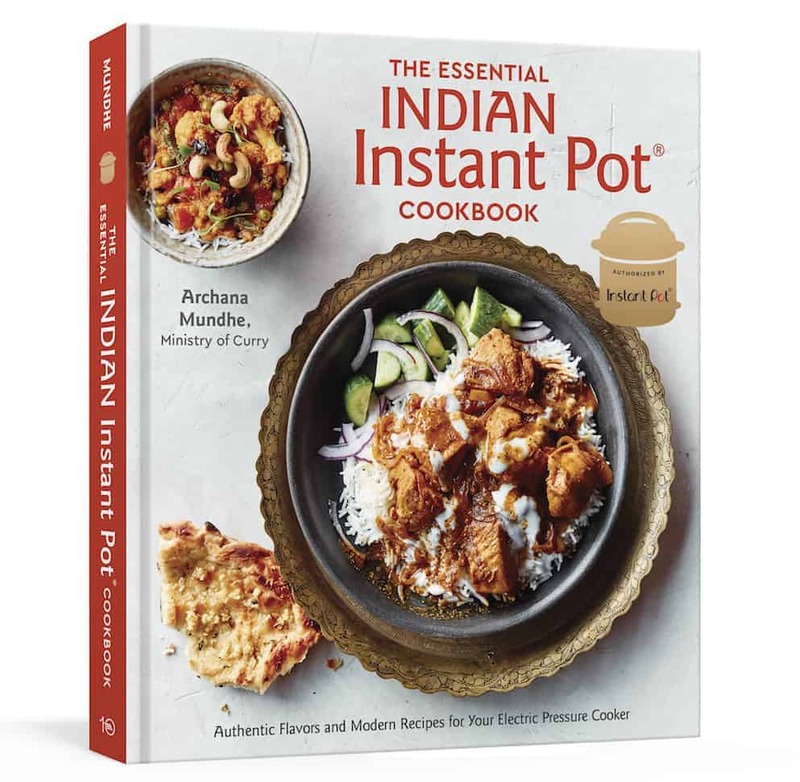 The first recipe to conquer is usually shankarparra, my children’s favorite. 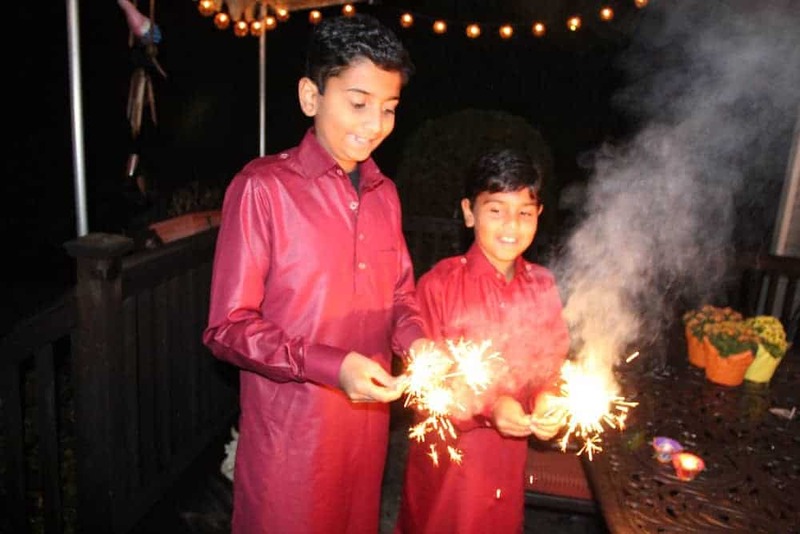 When my oldest son was in kindergaden, we started celebrating Diwali in his classroom. We explained the story of Diwali, his classmates painted and decorated clay diyas, and then everyone enjoyed nut free shankarparra. This year was very special to me as it was my youngest son’s last year in elementary school. It sadly also meant that this was the last year my family would do the classroom celebration. 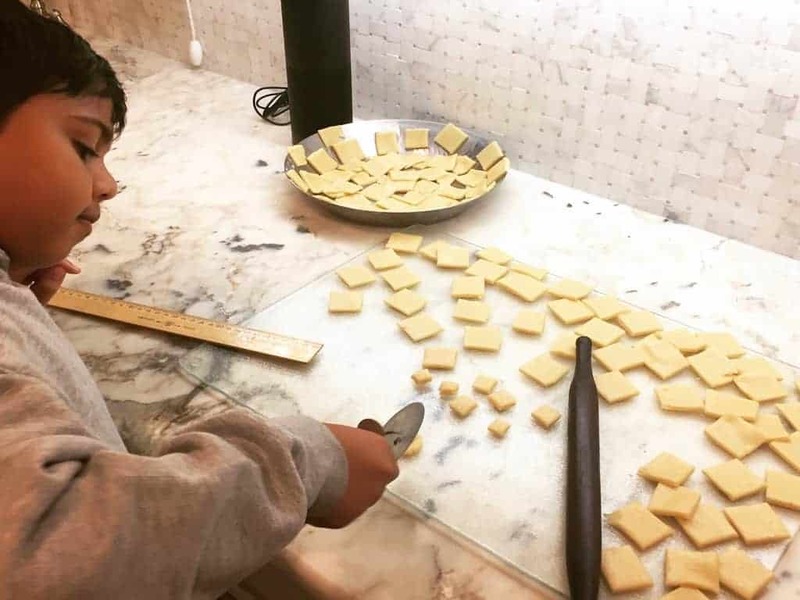 With my son’s help we prepared the treats for his class. We did the Diwali presentation to the class and the children and the teacher had a wonderful time. They loved learning about the festival of lights and they each went home with a pretty diya. Over the next week, I made rest of my faral and then moved on to the Diwali decorations. The boys have started to pick up on the tradition and this year they did most of the decorating. Lanterns and lights were put up. The house looked festive and was filled with the aroma of the Diwali treats! The first day of Diwali is Dhana Trayodashi. We lit our first Diya on this day and offered whole coriander seeds and jaggery to the God. This is an auspicious day for making important purchases, especially metals like gold and silver. I used this day to polish my silverware as I prepared for the Lakshmi Pooja. On this day, breakfast was a feast of faral and a hot cup of tea. The second day is Naraka Chaturdashi. Devotees wake up and bathe before sunrise while the stars are still visible. We did not manage to wake up that early, but we did start our day by praying together. This was a good day to gather with friends and family and share all of the sweet and savory treats we prepared. Our evening was filled with laughter, a talent show by the children, painting diyas and an elaborate meal. This year the evening ended with exchanging gifts and lighting up bright sparklers. The third day and most important day is the Lakshmi Pooja. The day started with customary phone calls to all that are near and dear wishing them a “Happy Diwali”. 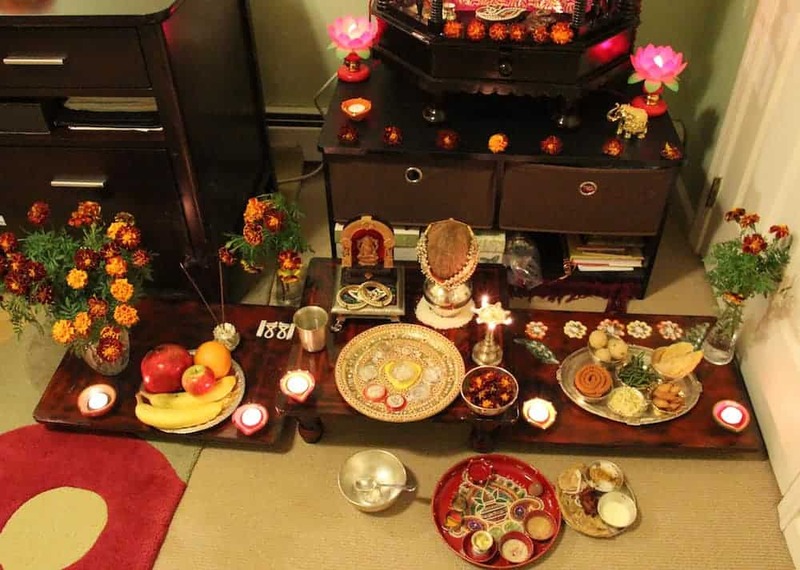 I then setup an elaborate pooja to worship Lakshmi, the goddess of wealth and prosperity. My younger son was very excited to help me with the rangoli that we made together in the front and back porch. It was a rainy and windy evening, so I did not get to take a photo of his first rangoli, but we will continue this new ritual of making rangolis together. In the evening, we all dressed up in our new traditional outfits and got ready to perform the pooja. 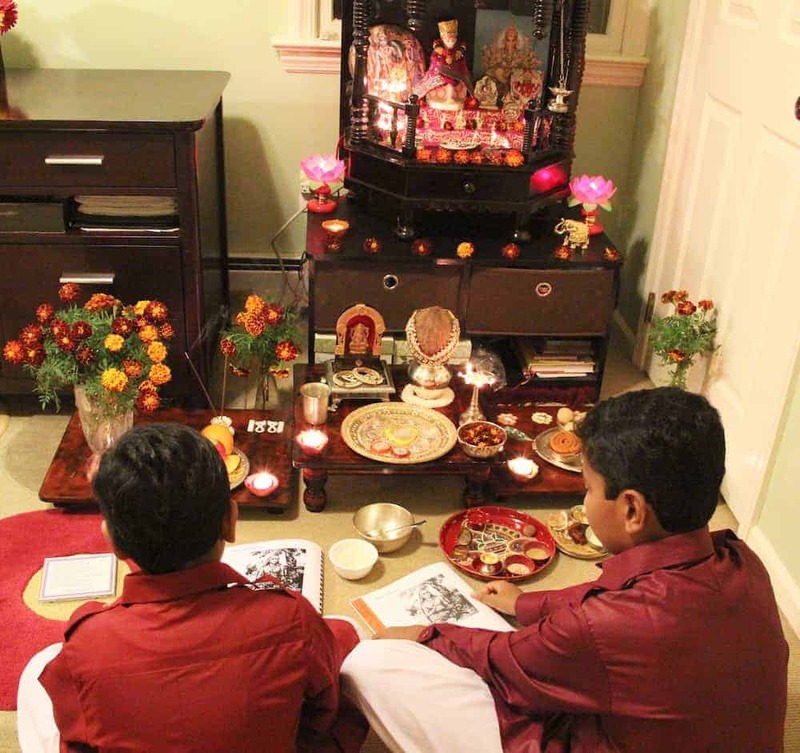 My older son performed the Devi pooja that he learned a few years back at Hindu Heritage Camp. We offered the Goddess a traditional meal that included delicious puranpoli. The family then enjoyed an elaborate meal which was followed by lighting sparklers with friends. This has become a tradition in itself for the last few years. The fourth day is Padwa or Bali Pratipada. It is the first day of ‘Kartik’ month in the Hindu calendar and marks the start of Hindu financial year. It is a special day for husband and wife. Another day to dress up and enjoy with more friends and family. 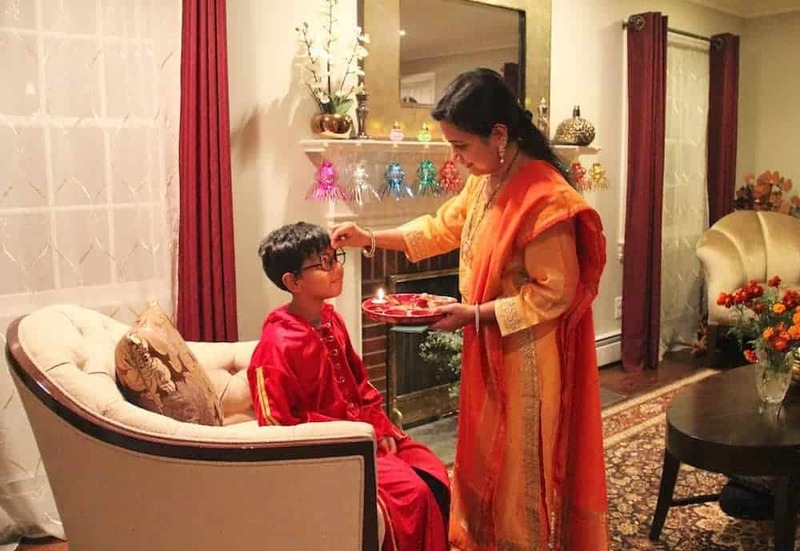 This year Padwa also happened to be on Halloween so I got to do Aarti for Clark Kent and Harry potter! 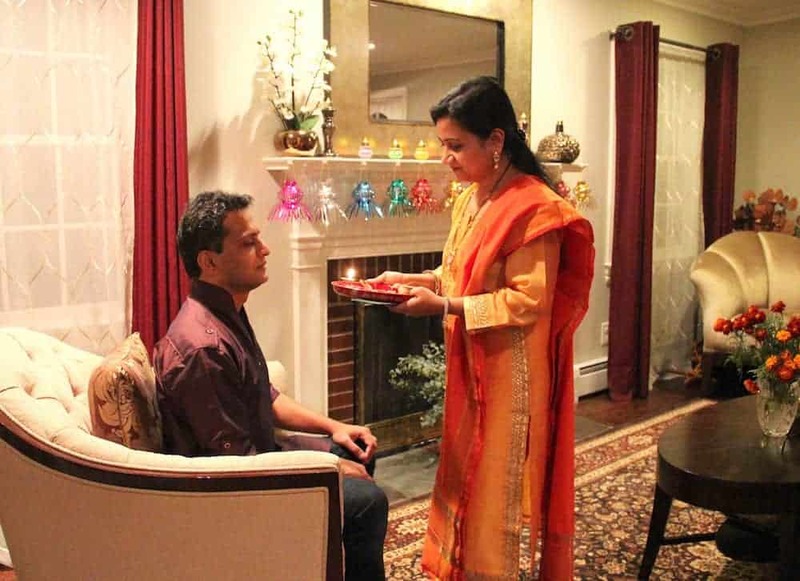 The last day of Diwali is Bhaubeej – a celebration of the bond between siblings. On this day I did Aarti for my two boys and prayed for their successful life. May the divine light of Diwali bring into your life peace, prosperity, happiness and good health. Happy Diwali! Such a great summation of Diwali. Love the vibrant pictures and what they all resemble. Love your sari too 🙂 The boys seem to be enjoying it all. Thank you Loretta! Yes the boys are really into it. Another first-rate post. Thank you. You are looking stunning and your family too ! Great post ?? Too good! I feel really very proud of being your sister! Its also very nice that you are trying to spread indian culture world wide! Keep it up! Our good wishes are always with you! Beautiful you & your family too. 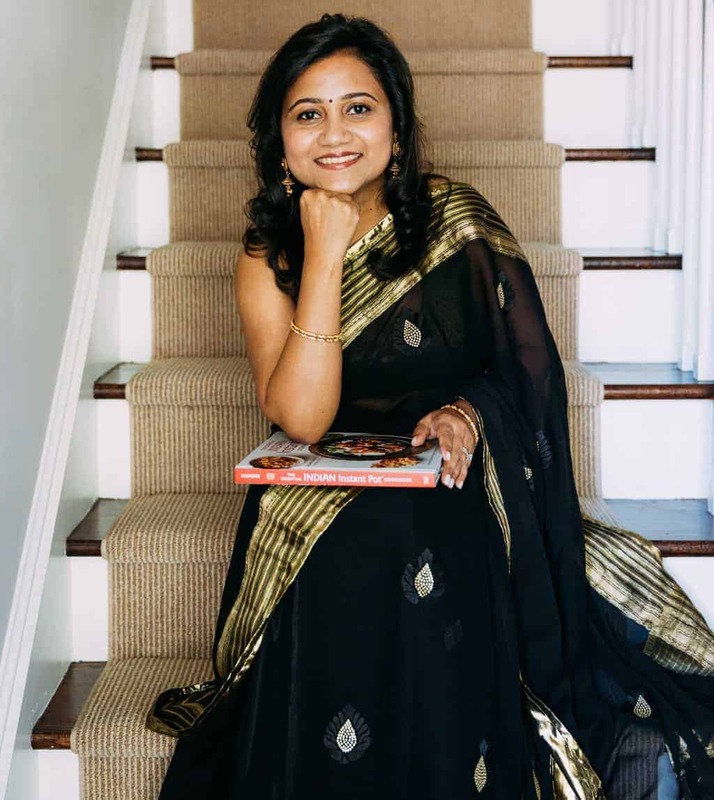 Namaskaram Archana – wow, wow, wow!!!! 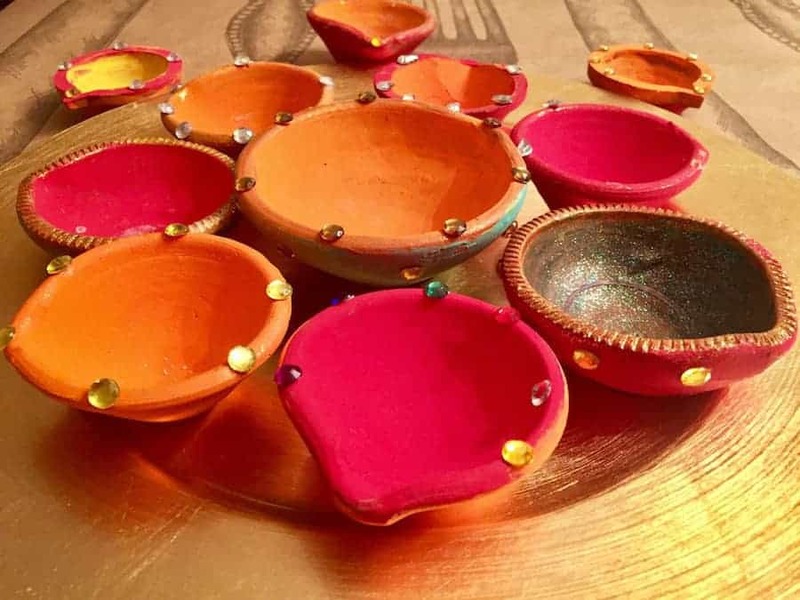 Sorry, but I only had a real chance of reading your article today and I hurry to tell you, this is the absolute best post about Diwali I have come across since I started blogging many years ago! I could give you a big big hug right now 🙂 :). 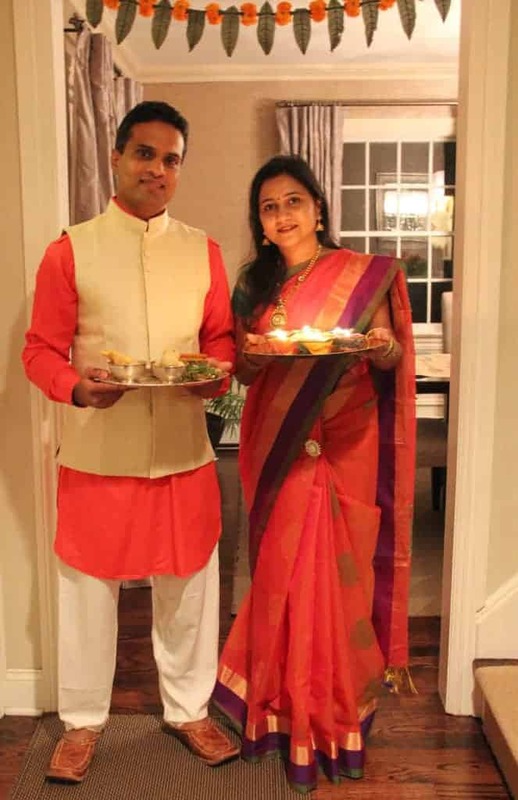 The pictures of your lovely family are so nice – it really shows us, who do not celebrate Diwali like you do, what it is all about – and…….you look gorgious in your red Saree (I am sure your husband thinks so too – 🙂 ) I will keep this post of yours in a special folder to look at it sometimes again. Thank you so much Carina! Your kind words made my day. 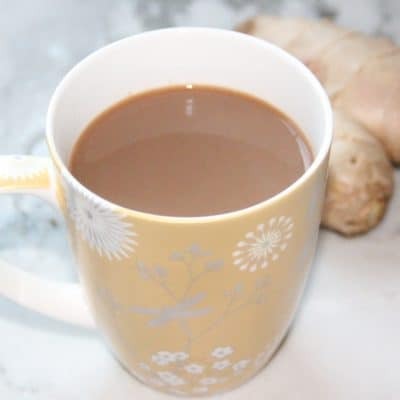 I am so happy you enjoyed reading this post and that it made you so happy! Thank you!! Happy Diwali and a Prosperous New Year to you all. Thank you Ashu for your kind words. Happy new year to you too! 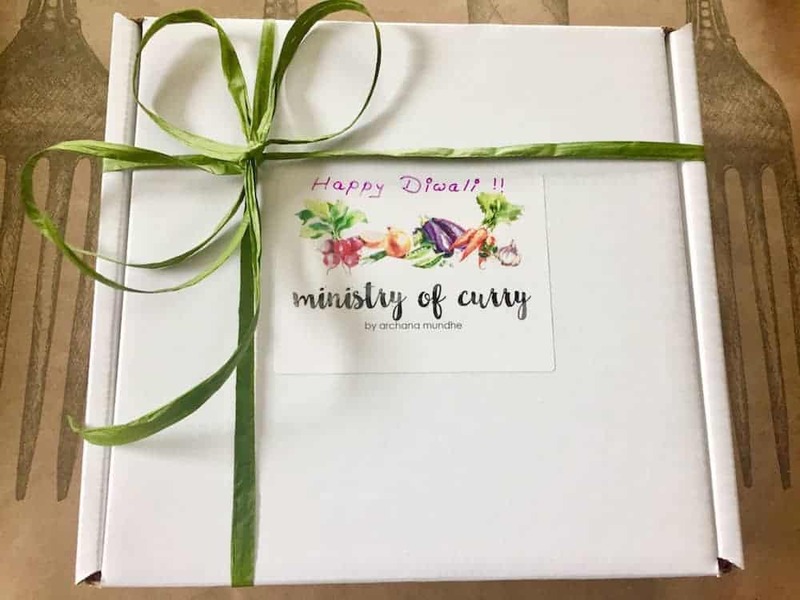 Love, love, love your pictures and description of Diwali. You have captured the essence of it all! I just got back from India, so am catching up with missed posts now. Thank you Sandhya! Diwali is my favorite indian festival. Hope you had a great trip to India?